Ground Penetrating Radar technology was recently used in Evansville, WY (Casper, Wyoming area) to assist the Envirocon Company in located underground utilities prior to excavation. The site was a former Chevron refinery and there was concern over what utilities may lay below the grade. One call locates were called to the site prior to GPRS’ arrival to mark out utilities. The ground penetrating radar survey on this site was able to verify the location and depth of the prior locates. 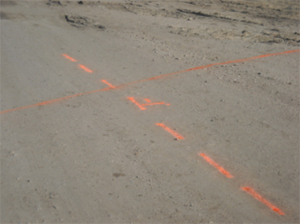 The Project Manager of Ground Penetrating Radar Systems Denver was also able to locate a pipe that was not marked out by any prior private utility locating company. 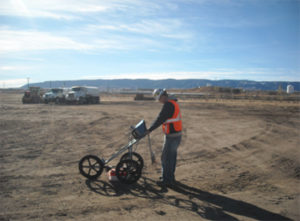 Locating utilities in Casper by using GPR is a great way to increase the chance that all impediments are discovered prior to any digging or excavation taking place. A radar scan can assist in locating pipes, conduits, gas lines, water lines, sewer pipes, trenches, duct banks, high voltage conduits and much more. Ground Penetrating Radar Systems of Denver, Colorado can assist on projects in the Casper, Cheyenne, Laramie, Jackson Hole, Green River and Rawlings areas in Wyoming.